The majority of species are low, perennial herbs. The spectrum of life forms is, however, much broader and includes a range from small annuals to trees reaching 13 meters or more in height. Here are some brief comments about the main types. Microchirita micromusa is a variable species, always with yellow flowers but with green leaves occasionally marked with red. It is a rarity, an annual which germinates, grows, sets seed and dies within a single season. These are plants germinating, flowering, fruiting and dying in one year or season. True annuals are very rare and are only found in genera which also include perennial species, e.g. in the South African genus Streptocarpus and the Asian genus Henckelia. The plants occur in tropical or subtropical areas with a pronounced seasonal climate. With the possible exception of Sinningia nordestina, the annual habit is virtually unknown among the New World gesneriads. This pattern is by far the dominant one in Gesneriaceae and essentially represents an adaptation to a seasonal climate. Two forms can be distinguished: monocarpic perennials (flowering and fruiting once, after one or several years of vegetative growth) and polycarpic perennials (flowering and fruiting periodically). In the aseasonal (ever-wet) parts of the tropics, this distinction becomes blurred as flowering and fruiting is often continuous, lasting over many years without interruption. This pattern can be referred to as “prolonged monocarpy”; it is found, for instance, in many species of Monophyllaea. These rainforest plants enter the reproductive stage soon after germination and this stage lasts, without interruption, for several to many years until the plants die. Death is often by external causes such as damage or desiccation etc., while undisturbed plants appear almost immortal. Most common are polycarpic perennials. They represent the typical growth form in subtropical, warm-temperate and temperate areas around the globe, and are also found in tropical regions with a slightly to pronounced seasonal climate. Perennation serves to survive a period with adverse conditions, either a dry or a cold (winter) season. Ground stems. These are distinguished from proper rhizomes by their unspecialized habit: the basal parts of the stems lie on the ground or are somewhat buried in the ground, producing roots for anchorage and water uptake. However, they lack nutrients stored in the stem or in cataphylls. Such ground stems are found in most ground herbs of ever-wet rain forests, e.g., most Cyrtandra species. Stolons. These are axillary side branches with markedly elongated internodes, creeping over the ground and producing adventitious roots. They serve for perennation, migration and multiplication. Conspicuous examples include species of Alsobia (with one stolon per node and monochasial branching), and Episcia (with two stolons per node and dichasial branching). Some species names allude to the possession of stolons e.g. Boeica stolonifera. Episcia cupreata produces stolons with adventitious roots, and is capable of quickly forming a large colony on the forest floor. This beautiful print is from the first publication of the species, as Achimenes cupreata, in Curtis’s Botanical Magazine (1847). Rhizomes and rootstocks. Typical rhizomes (= distinctly thickened horizontal underground shoots) are found in some Gesneriaceae of seasonal subtropical or temperate zones. Their function is manifold: (1) perennation = survival of unfavourable periods: the aerial plant parts die back at the beginning of the unfavourable season, and new aerial shoots are produced from the rhizome when favourable conditions return, (2) storage of nutrients (and to some extent water), (3) migration: by the elongation of the rhizome the plant migrates into areas hitherto not exploited by the roots, (4) multiplication: branching of the rhizomes leads to multiplication of the aerial shoots and thus vegetative propagation, (5) anchorage: with the aid of the rhizome-borne roots the aerial shoots are mechanically anchored in the ground. Rootstocks are shorter, much contracted and grow ± vertically, but a clear demarcation from rhizomes is not possible. Rootstocks and transitional forms to rhizomes occur in most rosette plants. 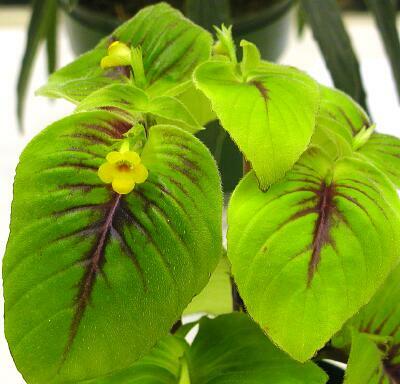 Examples are Saintpaulia (now included in Streptocarpus, Nishii et al. 2015), Petrocosmea, Corallodiscus, Didymocarpus, Ramonda, Haberlea, Jancaea etc. Very instructive are the rhizomes of Platystemma. They consist of a linear succession of swellings, each corresponding to the production of an aerial shoot that comprises a single leaf with one or two axillary flowers. Scaly rhizomes. 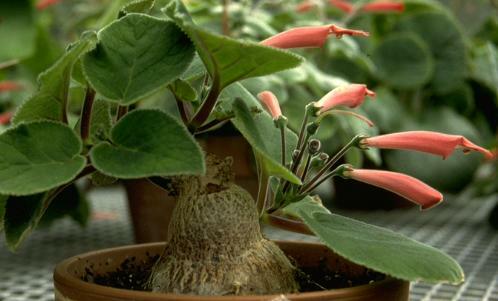 This special type of rhizome is found only in some neotropical Gesneriaceae (Gesnerieae-Gloxiniinae). They represent underground appendages of the shoot axis that serve as survival and propagation structures. They are one to several centimeters long and consist of a thin central axis with closely packed pairs or whorls of small, fleshy leaf scales. They survive in the ground when the above-ground plant parts die back in the dry period and sprout when favourable conditions return. As one plant usually produces several rhizomes, multiplication also takes place. 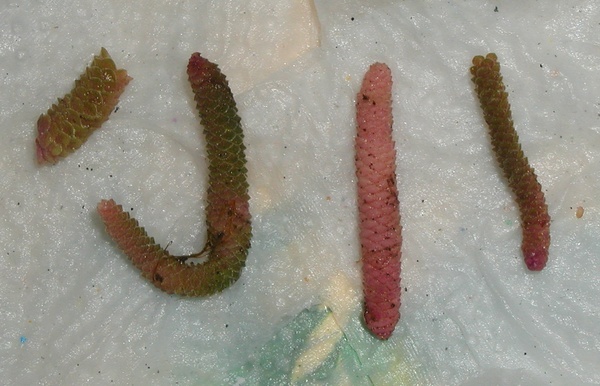 A well-known example is Achimenes, in which aerial scaly rhizomes are sometimes also found. Intermediate forms between stolons and scaly rhizomes are the so-called “stringy rhizomes” produced above-ground in Sphaerorrhiza (Gesnerieae-Sphaerorrhizinae). Scaly rhizomes in the Gloxiniinae vary widely in size and shape. These rhizomes of an Amalophyllon species from Belize are fairly small and narrow. Some Kohleria rhizomes can become very long and robust, and those from Smithantha are short but large and stubby. Tubers. 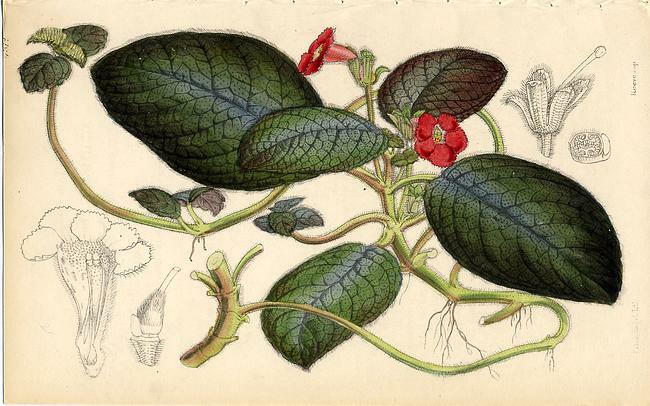 Like scaly rhizomes, tubers are found exclusively in the New World Gesneriaceae (Sinningia, Chrysothemis, Lembocarpus, Rhoogeton and some species of Nautilocalyx). The tuber may be buried in the ground, but (in Sinningia) is more often exposed, with only the base and the roots penetrating the ground. An above-ground portion of a tuber is sometimes referred to as a “caudex”, and this general habit as “caudiciform”. Either underground or caudiciform tubers may be globose, pear-shaped or flat. The size depends on the species and age of the plant. The largest tubers have been found in Sinningia macrostachya, reaching a diameter of up to 1 m.
Sinningia iarae has a large woody tuber, much of it above-ground.